Once a risky venture, both artistically and in terms of public acceptance, the integration of electronics with acoustic orchestral instruments is now an almost routine compositional gambit. This observation serves as background to Talking down the Tiger, a set of five recent works for electronics-supported solo instruments by Canadian composer Andrew Staniland (b. 1977), who also performs on electronics. Staniland’s compositions integrate their acoustic and electric sides as a matter of course, it being understood that any conflicts or contradictions between them would be the product of deliberate design. On all five of these pieces, which were composed between 2007 and 2013, the electronic element plays a largely supplementary role. The emphasis is on the soloist and the writing for him or her; Staniland favors a clear line and virtuoso performance. Percussionist Ryan Scott on Talking down the Tiger (2010); guitarist Rob MacDonald on Dreaded Sea Voyage (2013); flutist Camille Watts on Flute vs Tape (2012); cellist Frances Marie Uitti on Still Turning (2011); and soprano saxophonist Wallace Halladay on True North (2007) all actualize their pieces with skill and an expressive range indicative of interpretive sincerity. The latter is important since Staniland’s compositions suggest a spectrum of emotions as revealed in frequent changes in dynamics, tempo and register. This is epitomized in, for example, Flute vs Tape, which creates the sonic image of an impulsive, mutable character containing emotional multitudes. Staniland explores a different emotional register in Dreaded Sea Voyage, a three-part work inspired by Mahler’s fear of sailing for America. Here, MacDonald’s fluttering chords, shifting accents and rapid single line runs on nylon string guitar convincingly convey an atmosphere of nervous anticipation. The highlight of the collection, though, is Still Turning, which features a remarkable performance by Uitti. This gravely beautiful piece, which takes best advantage of the cello’s range and vocal properties, is marked by a slow, measured lower register line played with expressive dynamics which eventually moves up in register and culminates in virtuosic, technically expansive playing. As with most of the other works, the electronic component is most noticeable as the performance moves towards its conclusion. In fact, with its balance of emotion and technique, Still Turning seems to epitomize Staniland’s aesthetic. The Yamaguchi Center for Arts and Media celebrated ten years of being and doing in 2013. 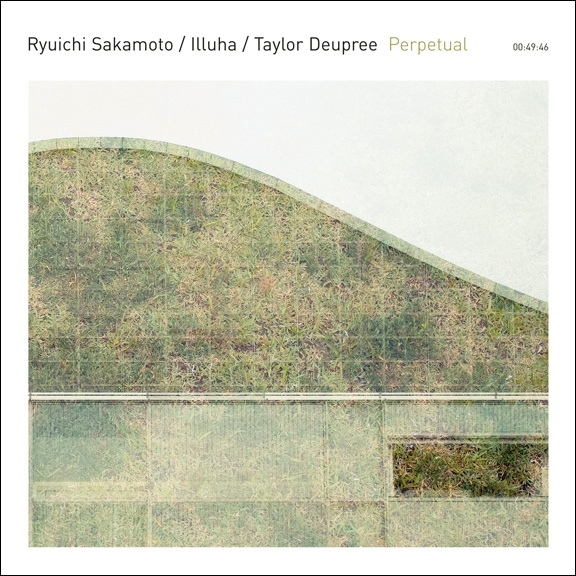 Among the celebrants were Ryuichi Sakamoto, Illuha (the duo of Tomoyoshi Date and Corey Fuller) and that most eminent small sound handler, Taylor Deupree (12k is his label). An ostensibly informal entertainment improvised on piano, guitar, pump organ, and synthesizers made enough of a “third mind” impression, that the four of them decided to preserve it for grateful listeners across the world. Exquisite ambience threatens to float you blissfully away, but microscopic, almost transparent, amniotic things are happening and they crave your attention. Children are at play in “Movement, 1,” and someone, not the children I suspect, is playing with blocks. Not ordinary blocks. Detail is of the essence to this quartet. A guitar is picked up by a signal receiver and scrambles its message. Static turns into a rain of hobnails. “Movement, 2” begins with movement inside the piano, notes being nipped in their respective buds, before further mechanical adjustments are made to the internal braces of its engine. Butterfingers drop a tool, a coin falls out of his breast pocket. A nectarous, wavering tone hovers, biding its time. Shards of frozen tears, fabric rustles impatiently. The wavering tone resolves itself back into Enoness. Final, third movement, slides down Sakamoto´s sweet axis, at its root excavations are being conducted. It gets sweaty. Birds are more than a little annoyed, field workers scribble notes assiduously. The odd sour note says, Put a ring around its tiny leg and release it back into the wild. loadbang continues their ongoing commissioning project that has resulted in over 200 works for the ensemble, performing premieres by Jordan Kuspa and Nils Vigeland, alongside works by their 2012 Call for Scores winner David Brynjar Franzson, Martin Iddon, Alex Mincek, and the ensemble’s trombonist William Lang. The Mannes American Composers Ensemble will perform works by Nina C. Young, Kate Moore, Andrew Tholl, and Zach Gulaboff Davis. TILT Brass ensemble takes the stage for the final Pop-Up of the fall. TILT presents new works by contemporary composers Anthony Coleman, TILT co-founder Chris McIntyre, and Catherine Lamb. Tenth Intervention presents We Are Legion, a new immersive chamber work with dance written by Dorian Wallace and based on the hacktivist collective Anonymous. Experiments in Opera co-founder Matthew Welch launches his first residency at the East Village avant-garde haven The Stone from December 8-13, 2015—a jam-packed premiere-filled series of 13 concerts over 6 days. Pacifica Quartet performs music by Elliott Carter, Janacek, and Beethoven. NYU Extended String Sextet performs works by Jacob Cooper, Dai Fujikura, Garth Knox, Andrew Norman, Kaija Saariaho, and Pulitzer-prize winning composer Caroline Shaw. Where is the border between language and music? How does sound harden into signification, and how does language break down into song? What is the difference between our perceptions of meaning in these two media? Composer Anna Clyne presents violinist Keir GoGwilt and composer Matthew Aucoin as they explore the fluid boundary between words and music with works that feel like music and poetry at once. The program will include new work by Aucoin as well as Kurtag, Celan, Webern and Berg. Ensemble Dal Niente continues its 10th Anniversary season with a three-city Neue Musik tour of contemporary German music. New York City’s Permutations concert series will be the final stop on Ensemble Dal Niente’s Neue Musik Tour of Chicago, Boston, and New York. Each composer featured on the Neue Musik program lives and works in Germany today, exhibiting at once an engagement with and struggle against the country’s rich cultural and musical tradition. International Contemporary Ensemble performs music by David Adamcyk and Zosha Di Castri, Natacha Diels, and Maria Stankova. The concert will be followed by a discussion with the composers and performers. French electroacoustic composer Bérangère Maximin presents Siklon Sound Objects, Microphonics, Digital Chimeras at Roulette. Phil Kline’s Unsilent Night returns for a 24th edition in cities across the United States and abroad. This year’s flagship New York City event takes place on Saturday, December 12, 2015 at 7:00pm, when composer Phil Kline will lead a massive chorus of boomboxes from the West Village to the East Village. Hundreds of participants will gather at the arch in Washington Square Park, and less than an hour and mile later, end up in Tompkins Square Park. The program pairs excerpts of John Adams’s John’s Book of Alleged Dances with the New York premiere of Kettle Corn Co-Artistic Director Chris Rogerson’s String Quartet No. 2. The quartet will also play short works by Michael Ippolito and Timo Andres, who will join the quartet as a pianist to close the program with Robert Schumann’s Piano Quintet. Carolyn Enger’s 3@3@3 Series at Spectrum features three sets of three composers’ work with a focus on the art of lyricism. Showcasing a wide range of repertoire, Carolyn will expand the idea of what it means to be lyrical, from Beethoven and Schubert to Rorem, Pärt, and Shaw, and shed light on each composer’s emotional expression. Quotations and Homages will feature newly-written works inspired by a variety of earlier composers and pieces, from Mozart to Brahms to Messiaen to Carter to Gubaidulina to The Velvet Underground. In a program both serious and lighthearted, older works will be brought to new light through piano, electronics and multimedia by contemporary composers Missy Mazzoli, Daniel Felsenfeld, Michael Vincent Waller, Tom Flaherty, Vera Ivanova, Peter Yates, Matthew Elgart, Adam Borecki, and Nick Norton. Lindsay Cooper, a modern composer and bassoonist for the 70s Rock in Opposition band Henry Cow left a legacy of amazing music before leaving this planet in 2013 after a long fight with MS. Two of her former band members joined a group of local musicians to perform a concert of some of her work at Mills College’s Littlefield Concert Hall. Fred Frith and Cooper were both members of the band Henry Cow, a band who invented new ways to combine rock and experimental music in the 70’s heyday of progressive rock. Source: 120 Years of Electronic Music.